Comes on 'Gamma Ray' Green Vinyl. 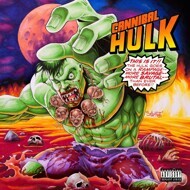 Cannibal Hulk is the collaboration between producer Stu Bangas and lyricist ILL BILL. Prior to ever working together both Bill and Stu traveled in similar circles. Both heavily worked with Vinnie Paz (Jedi Mind Tricks/AOTP) which led to Stu being on Bill's The Grimy Awards and Bill being featured on Stu’s albums with Esoteric and Blacastan. Having worked together on those tracks is what led to the manifestation of this project. Add to the scenario their love of comic books and the concept Cannibal Hulk was born. With both feeling most at home with aggressive music, this album sonically sounds exactly as it’s title indicates. Can Hulk features Vinnie Paz, Goretex, Slaine, Snak The Ripper and DJ Eclipse.